Running an ice cream shop requires lots of planning, preparation, time and energy. Ice cream shop owners have to think about supplies, ingredients, keeping stock, and ensuring the quality of the ice cream they are serving. They are also responsible for hiring and training professional employees. With all those responsibilities, it's no wonder that the décor or theme of an ice cream shop may be considered a lesser task. However, choosing a theme for your ice cream shop and creating a decorative scheme that supports that theme will help your shop appeal to a wider range of customers. There are many different themes you can choose from and many simple ways to implement these themes. It's always worth the investiment to aim for decor that is appealing and fun for your customers. By far, the most popular choice for ice cream shop décor is the decade theme. Selecting a decade such as the infamous 1920s, 1950s, or 1960s will appeal to an older crowd and create a nostalgic feel for your entire shop. You can find authentic decorative pieces from those decades, or select modern furniture and décor that resembles pieces from the decade of your choice. Your ice cream shop doesn't have to be a throwback to the good old days. Modern themes can be just as successful as decade themes. You can create a theme around a favorite style of music, a favorite region of the world, or even around the ice cream itself. It's always a good idea to appeal to families with your ice cream shop décor, as families will likely be your biggest customers. Create a family friendly atmosphere by including video games or tabletop games for children to enjoy. You can use bright, energetic colors to liven up a space and make it a fun place for families to gather and enjoy your delicious ice cream. One way to easily transform the look and feel of your ice cream shop without spending a great deal of money is to outfit your staff with unique and attractive uniforms. When your employees wear uniforms, your ice cream shop develops a cohesive and unified look. Uniforms can also enhance the professional appearance of your ice cream parlor. You can find ice cream uniforms that match the logo, colors, design, or décor of your ice cream shop, which will help bring your entire brand together. Don't forget to make sure that uniforms are laundered regularly and that employees wear their uniforms at all times. Dirty uniforms can quickly detract from the attractive and professional appearance you are trying to create. 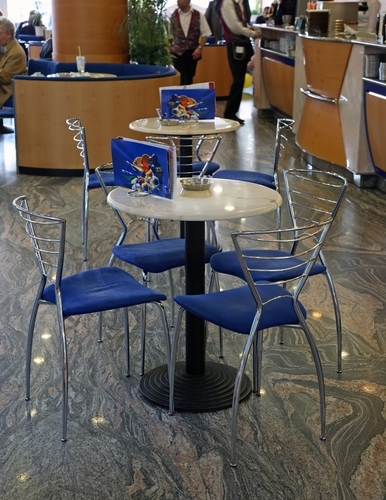 Decorating your ice cream parlor is a great way to stand out from your competitors. Many restaurant owners forego investing in a décor scheme because they feel that resources can be better spent elsewhere. However, the appearance of your ice cream shop will do a great deal in establishing your brand, improving your reputation, and ensuring that customers have a fun and satisfactory experience.